Our Stink Bug Control home barrier spray keeps them out when they’re trying to come in. Stink Bugs will be returning this Fall! MOSQUITO CLEAR can help! Timing is everything! The best time to apply treatments is August through October. Schedule now to ensure best results! Receive $25 OFF First Application*. Stink bugs don’t just smell, they come to invade and once they do, they come back each year! Take control of your home from this obnoxious odor-emitting invader. Our Stink Bug home barrier spray keeps them out when they’re trying to come in. We use a mild insecticide applied to the exterior of your home as a shield from the months of August to October. 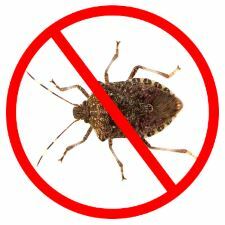 Every three weeks we will be out to reapply, to keep your Stink Bug Shield Strong.